TAVARES – (RealEstateRama) — Lake County Building Services Supervisor/Deputy Building Official Tony Lopresto has been named the President of the Construction Licensing Officials Association of Florida. The Association provides a forum for licensing officials to meet and network regarding enforcement regulatory issues, solutions and best practices; provides education and certification for professional development and monitors current legislation and applicable and/or potential law changes. 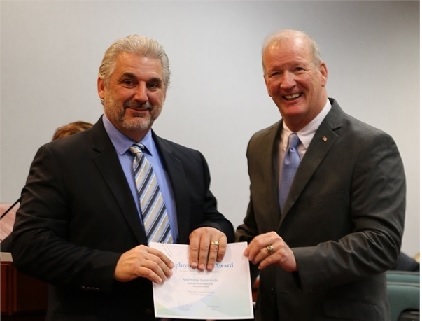 Lopresto, who recently celebrated 15 years of service with Lake County, said he enjoys helping people negotiate the obstacles of government as it pertains to building, permitting and contractor-related issues. “Finding a way to assist people with their projects and problems while remaining compliant with our ordinances and codes is very rewarding,” said Lopresto. As part of his duties at Lake County, Lopresto also supervises the Licensing Investigator section within the Building Services Division. He holds multiple licenses through the Department of Building and Professional Regulation and is an active member of the Building Officials Association of Florida. For more information about Lake County Building Services, a division of Lake County Economic Growth, visit https://lakecountyfl.gov/departments/economic_growth/building_services/.